Liposome: Encapsula's Scientific Blog: How does Clodrosome® (Clodronate encapsulated liposome) kill macrophages? How does Clodrosome® (Clodronate encapsulated liposome) kill macrophages? After Clodrosome® has been dosed to the animal by the chosen route, the clodronate liposomes will come into contact with macrophages and other phagocytic cells. The phagocyte immediately recognizes the liposomes as foreign particles and proceeds with destroying these invading particles. The first step in this destruction is phagocytosis in which the liposomes are engulfed by the cell into an internal vesicle known as a phagosome as shown in the figure below. Lysosomes, which contain many types of destructive enzymes, including phospholipases, fuse with the phagosome forming a phagolysosome. The lysosomal membrane also contains proton pumps which will lower the internal pH of the phagolysosome. The low pH, phospholipases and other macromolecular interactions all contribute to compromising the liposomal membrane thus releasing the encapsulated clodronate. 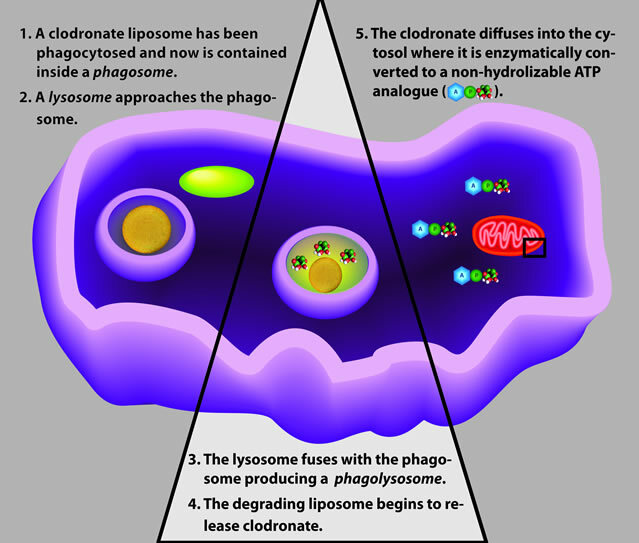 The low internal pH of the phagolysosome may contribute to the ability of the clodronate to cross the phagolysosomal membrane into the macrophage’s cytosol. Once in the cytosolic medium, clodronate is mistakenly recognized as cellular pyrophosphate and used by several Class II aminoacyl-tRNA synthetases to produce a non-hydrolyzable ATP analog, adenosine 5?-(β, γ-dichloromethylene) triphosphate (AppCCl2p)1–3. The exact mechanism by which AppCCl2p causes cell death remained elusive for some time until Lehenkari and coworkers generated data which supported the hypothesis described in the lower figures. Basically, their hypothesis involves cytosolic AppCCl2p crossing the mitochondrial outer membrane and irreversibly binding to the ATP/ADP translocase which transverses the mitochondrial inner membrane. Inhibiting this enzyme initiates pore openings in the mitochondrial inner membrane. Loss of mitochondrial inner membrane integrity, in turn, results in depolarization and allows molecular signals to be released from the mitochondrion which initiate cell death via apoptosis4. Note that the ability to internalize clodronate from the external medium is unique to osteoclasts, therefore free clodronate is toxic only to these cells in the bone when dosed to animals. The only proven effective method for delivering clodronate intracellularly to other cell types in vivo is via liposomes as described above. 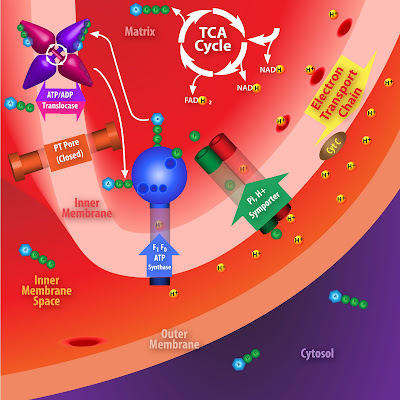 Figure 2-In a functional mitochondrion, the TCA cycle generates high-energy protons in its matrix which are pumped into the inner membrane space along the electron transport chain (requires cytochrome C as a cofactor). The resulting proton gradient provides energy for the f1f0 ATP synthase to generate ATP from ADP and Pi. ATP is transported to the cytosol via ATP/ADP translocase. The translocase only functions when both ATP and ADP are bound to the enzyme, therefore one ADP is removed from the cytosolic ADP pool for each ATP leaving the mitochondrial matrix. Figure 3- However, when AppCCl2p diffuses from the cytosol into the inner membrane space, it binds to an ATP-binding site on the ATP/ADP translocase inhibiting the transport activity. This inhibition initiates a cascade which eventually opens the PT pore depleting the electrochemical and proton gradients as well as releasing mitochondrial proapoptotic factors, such as cyt C, into the cytosol. See reference 4 for further detail. 1. Rogers, M.J., Russell, R.G.G., Blackburn, G.M., Williamson, M.P. & Watts, D.J. Metabolism of halogenated bisphosphonates by the cellular slime mould dictyostelium discoideum. Biochemical and Biophysical Research Communications 189, 414-423 (1992). 2. Rogers, M.J. et al. Inhibitory effects of bisphosphonates on growth of amoebae of the cellular slime mold dictyostelium discoideum. Journal of Bone and Mineral Research 9, 1029-1039 (2009). 3. Frith, J.C., Mönkkönen, J., Blackburn, G.M., Russell, R.G.G. & Rogers, M.J. Clodronate and Liposome-Encapsulated Clodronate Are Metabolized to a Toxic ATP Analog, Adenosine 5′-(β,γ-Dichloromethylene) Triphosphate, by Mammalian Cells In Vitro. Journal of Bone and Mineral Research 12, 1358-1367 (1997). 4. Lehenkari, P.P. et al. Further insight into mechanism of action of clodronate: inhibition of mitochondrial ADP/ATP translocase by a nonhydrolyzable, adenine-containing metabolite. Mol. Pharmacol. 61, 1255-1262 (2002).